Quinnipiac University, English Department, Hamden, CT *EN 102 – Elements of Composition II: Critical Explorations of Barbie and other Retellings of Femininity This course is a continuation of EN 101 that emphasizes argument, persuasion and research writing. Students compose longer and more complex essays than in EN 101, and some attention is paid to writing across the curriculum. The course reading, research, and writing in this course focuses on the various representations and retellings of femininity mean, not only for girls and women, but to society at large. The readings, which include expository essays and digital texts and images, plus several longer works of literature serve to unify the course content. *EN 102 – Elements of Composition II: Critical Explorations of Barbie and other Retellings of Femininity This course is a continuation of EN 101 that emphasizes argument, persuasion and research writing. Students compose longer and more complex essays than in EN 101, and some attention is paid to writing across the curriculum. The course reading, research, and writing in this course focuses on the various representations and retellings of femininity mean, not only for girls and women, but to society at large. The readings, which include expository essays and digital texts and images, plus several longer works of literature serve to unify the course content. *EN 220 – The Short Story as Genre: Women of the African Diaspora This course covers the development of the use of short story by women of the African Diaspora (African-American, Caribbean, and Puerto Rican, in particular) from the 20th century to the present with intensive study of authors: Toni Morrison, Zora Neale Hurston, Alice Walker, Olive Senior, Jamaica Kincaid, Rosario Ferré and others. Students explore the ways Black women have contributed languages and forms to the literary tradition. Emphasis is placed on close reading of selected texts and exploration of the intersections of race, gender, and class that are represented in the literary works. Quinnipiac University, English Department, Hamden, CT EN 101 – Elements of Composition I: Autobiographical Explorations An introduction to academic writing focusing on techniques for effective writing by studying the writing process and the skills necessary for producing purposeful, unified and coherent short essays: rhetoric, effective diction, revising techniques, critical reading, critical thinking, awareness of audience, and introduction to research and documentation. Syracuse University, Writing Program, Syracuse, NY *WRT 205 – Critical Research and Writing: This course focuses on the study and practice of critical, research-based writing, including research methods, presentation genres, source evaluation, audience analysis, and library/online research. Students complete at least one sustained research project. Syracuse University, Writing Program, Syracuse, NY WRT 105 – Practices of Academic Writing: This course is an introduction to academic writing that focuses on the practices of analysis and argument, practices that carry across disciplinary lines and into professional and civic writing. *Courses include(d) the use of online blogs, Facebook microblogs, and/or digital media compositions. 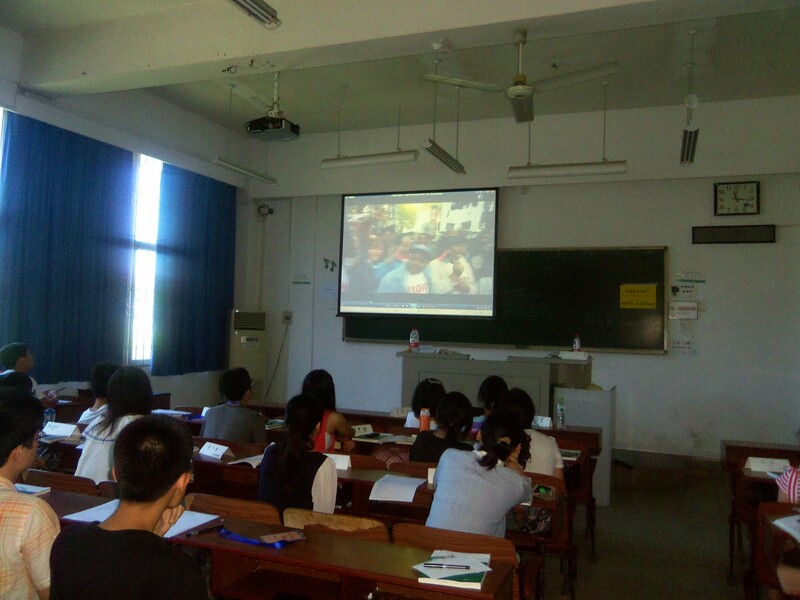 WUSIEP students viewing Public Enemy’s 1989 video for Fight the Power.